I was recently sent an article about the discovery of 5,000 pieces of rock art located in 11 locations in Mexico. Said to predate Spanish rule, they would appear to be somewhere between 600-1,000 years old. Usually I’m intrigued by such discoveries, but this time I was unmoved. My first thought upon seeing them was that they were made by bored pre-Columbian children. That’s not the first time I’ve felt this way about ancient art. In 1998, on a trip out west, Deb and I hiked a petroglyph trail in Arizona with our kids, Molly and Andrew, and we saw various shapes and figures scratched or crudely chiseled on boulders. Nice hike, but I wouldn’t do it again for the art. However, before the reader condemns me as a philistine, I must say that I have found some ancient art to be immensely powerful. In 1999, this time without the kids, Deb and I traveled to the Dordogne region in France. The Dordogne River valley is one of the most beautiful places on earth and the limestone caves and caverns along the river’s banks made natural dwellings for early humans. 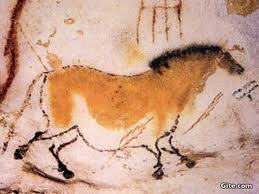 Evidence of humanoid occupation dates back 400,000 years, and beginning 25,000 years ago there is evidence of art. The first thing that strikes the visitor upon arrival at the grotte is how simple and straightforward everything is. There is a small gift shop and ticket booth. That’s it—no Font de Gaume burgers, no Friday night light show extravaganza, and no theme park with a special train to spare fat Americans the need to walk. We were very lucky going there when we did. Access to the cave is restricted and travelers must book tours well in advance, which from what I’ve recently read on the Internet is almost impossible to do, as so few people are now allowed in. Indeed, the most famous of these caves, Lascaux, has been closed to visitors for years and what one visits is Lascaux II, a man-made replica. Though it is astonishing in its accuracy and fidelity to the original, it seems to me like traveling to the Sistine Chapel but viewing a clever copy of Michelangelo’s fresco located in a nearby warehouse. The Grotte de Font de Gaume is the real thing and Deb was right to take us there. I quote now from a journal I kept at the time. What the writing lacks in polish I think it gives back in immediacy. The pictures were gathered from the Internet, since for reasons that should be obvious to the reader, no photography is permitted in the grotte. Sadly these photos, good as they are, provide little of the power and mystery of what one sees inside the cave, nor do they give any sense of how the images seem to change and move in varying levels of light. 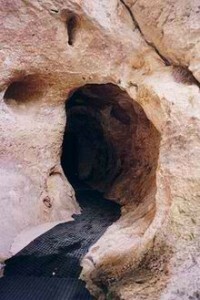 It was only a half hour drive to the town of Les Ezyies where the grotte is located, and we arrived early. Deb had made reservations in the States and it’s just as well she did since people were being turned away when we arrived. Only a limited number of visitors are allowed in the caves each day because carbon dioxide and moisture from their breathing can, and have, caused the cave paintings to deteriorate. 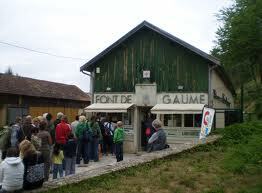 Most sites of prehistoric art are closed for just his reason but Font de Gaume is still open. I suspect it won’t remain so. The cave is cool inside and of constant temperature. Perhaps that is what has allowed the artwork to survive all these years. A sign told us to wear warm clothing but the word came too late for me. The day was an extraordinarily hot one and I had brought no warm clothing along. Luckily I’d left my navy blue blazer on the back seat of the car. I must have made an interesting sight marching into the cave through its small entrance in khaki shorts, hiking boots, and a dinner jacket! Our guide, who spoke only French, was in his late twenties or early thirties, handsome, and charming. It was clear that the mystery of the cave held a powerful spell over him. I could not understand what he said, my French is far too weak, but his eyes lit up and his voice dropped to a whisper as he described the creation of the amazing paintings we were viewing. There was no mistaking his feelings. Indeed, those feelings affected us all. Deb, whose French is excellent, dutifully whispered a translation to me when she could. No one knows much about the ‘why’ of the paintings, but a little is known of the ‘how’. The images were clearly planned in advance and they utilize the natural contours of the cave walls to produce something of a three dimensional effect. Some of the images are rather high up and some at knee level. All the images are of animals and nearly all are of game animals. Only one, set away from the others, is known to be of a predator, a kind of cat, but two other images may also be of predators. The animals are grouped in herds and in some cases interact with each other, licking one another. The images often show a sense of perspective. The pigment —they used only two, red and black —was blown on to the walls through hollow bones. 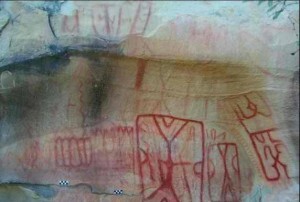 In some cases small amounts of chiseling was used to enhance the three dimensional effect, though in most cases the effect was gained by using the cave wall contours. 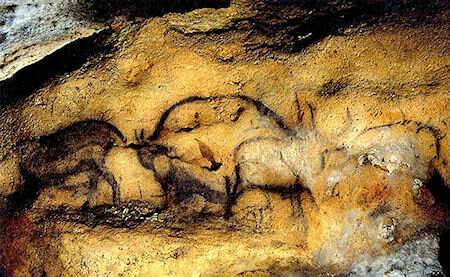 Finally, though the paintings were faint and one would assume a bright light was needed to see them best, it was only when our guide turned down the minimal cave lighting to the level of torchlight that the animals leapt from the walls and truly came alive. Of course the dim light explained the use of only two colors. In such lighting the artist would have been working in tone and not color. Much about the paintings remains in the realm of speculation. Why were the pictures made? Who made them? What are the meanings of the groupings of the animals and why these specific animals? These and a thousand other questions could be asked and not answered. Deb and I did have some thoughts on the matter. Deb was struck by the sexual appearance and symbolism of the caves, of how the narrow vertical passages reminded her of female genitalia. Perhaps, she suggested, the images were meant to ensure the fertility of the herd animals on which these peoples depended for food. However, no evident remains of any religious ceremonies or sacrifices have been found, which seems odd since there are no signs of people living in the cave, suggesting that it may have been reserved for some special use. I wondered whether the symbols were mainly preventative, meant to keep evil from the animals and ensure the continual supply of meat and game. Life in that bountiful valley must have been good for the times since where else but in a fertile land could such a fledgling society spare the human effort to make such images? Indeed, I wondered if women, perhaps priestesses, hadn’t made the paintings since it was their bodies that were associated with fertility. Deb thought not, saying that man places sperm in the woman and ancient man had likely placed the images in this womb of the earth. I suppose no one will ever know the truth of the matter. The answers died with these brilliant early artists. Font de Gaume is a good place, a holy place. There ends my journal entry. On a subsequent visit to France in 2009, this time to the Medoc, we were spending a day in Bordeaux before we flew home to the States. The morning we were to leave, Deb wanted to go to the Musee d’ Aquitaine, primarily to see the Venus a la Corne de Laussel, a bas-relief from the region where the Grotte de Font de Gaume is located. The Venus dates from 25,000 years ago, and is one of the oldest sculptures ever found. 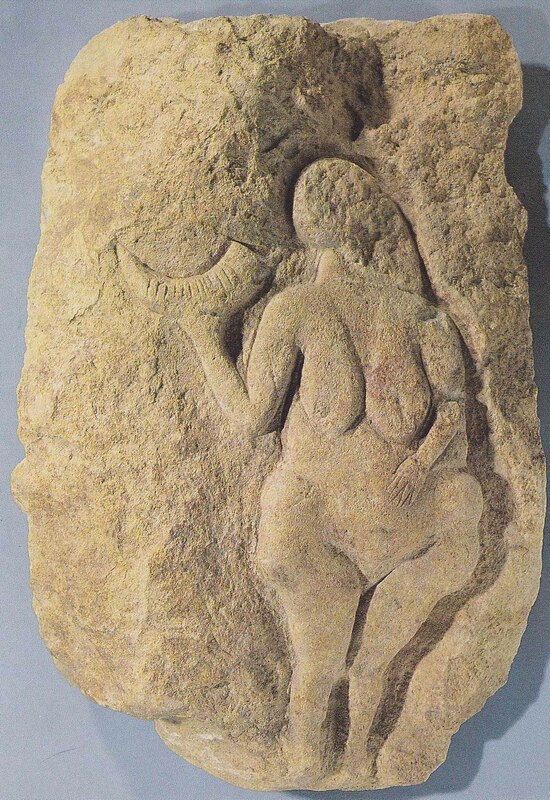 This Venus supports the idea that fecundity was a principal motif of paleolithic art. The woman depicted appears to be pregnant, but even more to the point, she is shown as a ripe fruit, a bringer of much needed life. Certainly the image is symbolic. Living in small bands and tribes, scrambling from place to place, fleeing from predators; it is hard to believe that a real woman living at the time looked anything like this sculpture. It is instead an evocation of the very powerful idea of fecundity. An abstract idea, perhaps, but in early humankind’s daily struggle against extinction I think it would be very hard to overestimate the importance of the pregnant female. She is a physical manifestation of the renewing process of birth during a time of frequent death. 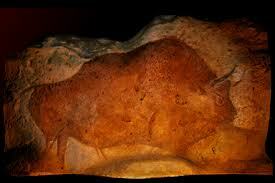 I do not find it hard to imagine that the Grotte de Font de Gaume is also a temple to this idea.